Hidden back in the original village of Datca, about a 5 minute drive from the new coastal town of Datca, Turkey, surrounded by privacy walls is the luxury hotel Mehmet Ali Aga Konagi. 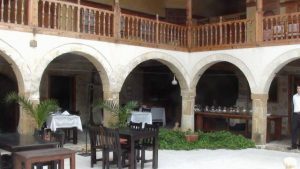 The hotel is housed in a Turkish mansion, built originally in 1809 by Mehmet Ali, who was the wealthiest person in the Datca Peninsula. The mansion was allowed to deteriorate until the early 2000, when the property was bought and renovated into the hotel that it is today. 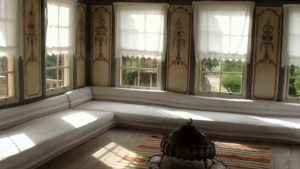 Many of the original details were kept, including the wall and ceiling paintings, and the rooms are furnished with antiques. Inside the original mansion is still the family Turkish Bath, still in use today, heated by wood fires. We visited, were shown many of the rooms and the Turkish Bath and had a lovely lunch of traditional Turkish foods. We recommend this as a stop for lunch or dinner or even a Turkish Bath on any itinerary that includes Datca. 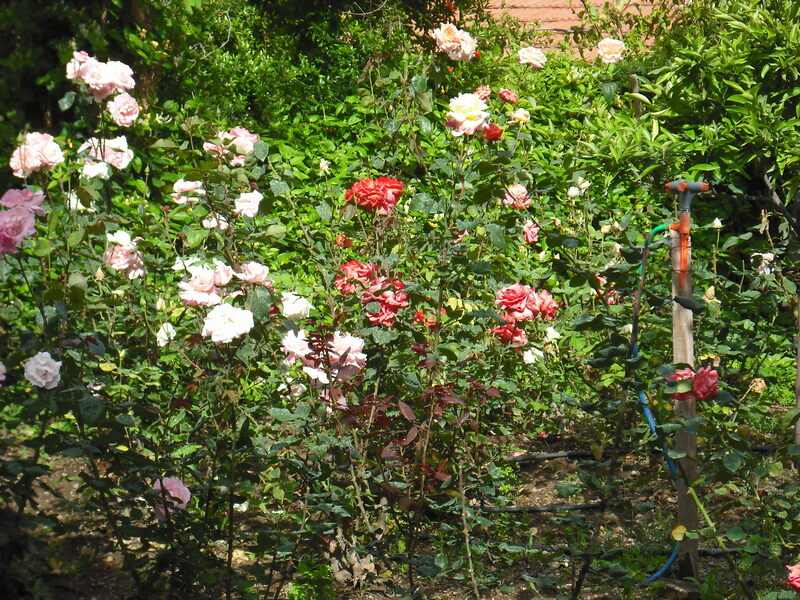 We entered into the hotel grounds surrounded by blooming roses. 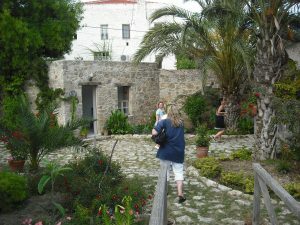 Next to the gate entrance are hotel rooms that have been created within the old stone stables. Up past the wood burning stove, where the bread is baked is the original mansion that houses the Turkish Bath, deluxe hotel rooms and the hotel restaurant open to the courtyard. A small citrus grove is behind the main mansion building where intimate dinners are held. 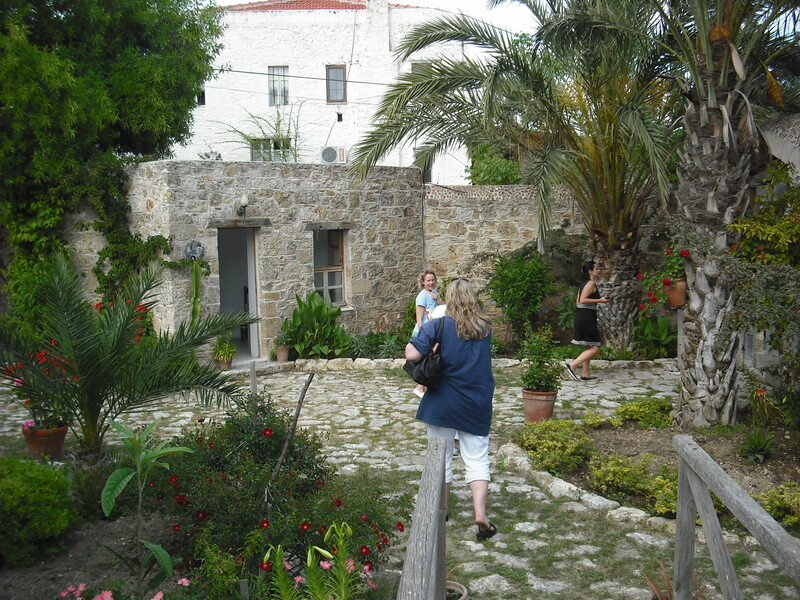 The hotel has an organic kitchen garden that supplies the restaurant for lunch and dinner meals and extra virgin olive oil is pressed from olives gathered from their trees. We had a lovely lunch in the courtyard under the loggia of a selection of fresh vegetable mezes including braised nettles, fresh artichokes, and fava beans, followed by a salad of various lettuces and herbs, with a main course of lamb slowed cooked in the wood oven. Stop in Datca while cruising from Marmaris to Bodrum, or visit Datca as a clearance port when entering Turkey from the Dodecanese Island of Symi. And be sure to make time for lunch or dinner at the Mehmet Ali with a Turkish Bath before or after. Also nearby is the Datca Olive Farm with their own extra virgin olive oil for sale in the farm’s shop, and in Datca are honey shops as Datca is considered the center of Turkish pine honey or Bal.